Jurist & Antifederalist leader. Member of court which in 1787 issued the first reported precedent for judicial review. His home stood 3 miles N.E. 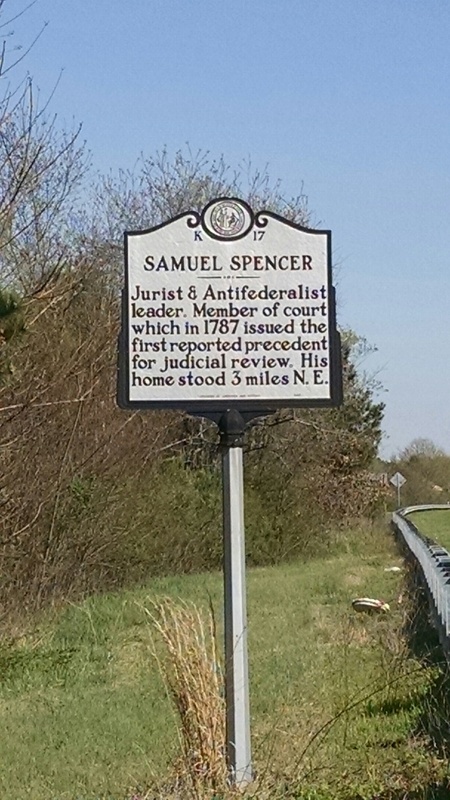 Samuel Spencer, superior court justice and university trustee, was born in East Haddam, Connecticut, in 1734, the son of Samuel and Jerusha Spencer. Descended from highly respected and wealthy New England families, Spencer attended the College of New Jersey, where he graduated in 1759. It remains unclear as to when or why he moved to North Carolina. He was living in Anson County by October 1765 when he was appointed county clerk. From 1766 to 1768 he represented Anson County in the Colonial Assembly. During the War of Regulation he served as an officer in William Tryon’s army and participated in the campaign leading to the Battle of Alamance. However, his allegiance to the Crown waned in the early 1770’s and he served as Anson County’s representative to the first three provincial congresses of 1774-1776. In 1777 he was appointed one of the first three justices of the superior court, the forerunner to the North Carolina Supreme Court. 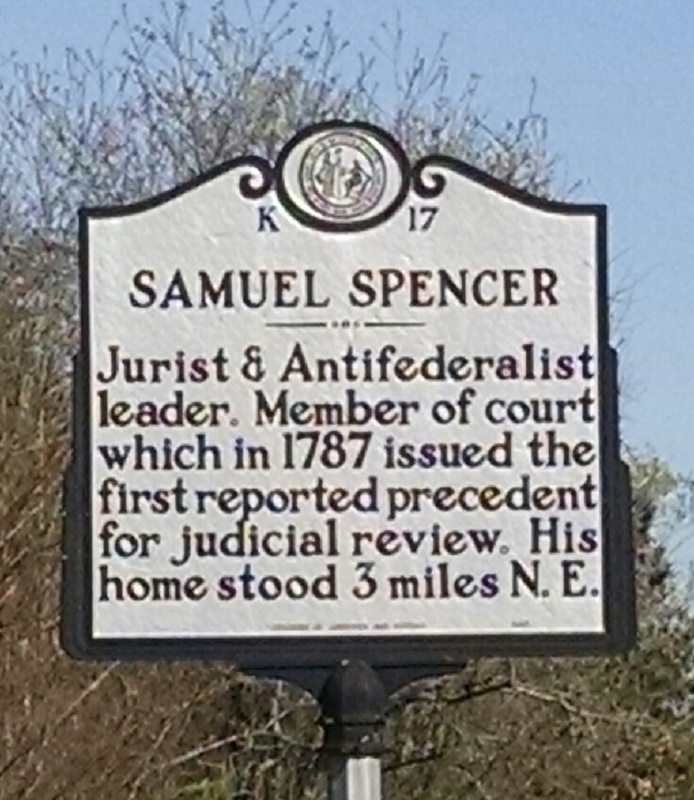 In 1787, Spencer and his fellow Superior Court judges John Williams and Samuel Ashe oversaw a landmark case in legal history. When Elizabeth Cornell Bayard attempted to overturn the confiscation and purchase of the properties of her father, a noted Loyalist, by Spyers Singleton, the court agreed with her that the confiscation acts of 1785 had violated the Fourteenth Article of the 1776 state constitution which ensured all citizens a trial by jury in cases that could result in a loss of property. The case, Bayard v. Singleton, set a precedent for judicial review. The North Carolina case preceded the more famous court case Marbury v. Madison, often credited with such establishment, by more than sixteen years. A staunch Anti-Federalist, Spencer was one of the leading members of his faction at the 1788 Constitutional convention at Hillsborough. He argued against a strong Federal government contending that the Constitution as drafted did not assure a bill of rights. At the Fayetteville convention the following year, Spencer was one of the minority members who voted against ratification of the United States Constitution. After the Constitutional debates Spencer retired to his plantation along Smith’s Creek near Wadesboro. He became a founding trustee of the University of North Carolina in 1789. Married in 1776 to Phillipa Pegues, Spencer was the father of four children. Aside from his participation in Bayard v. Singleton and the Constitutional debates, Spencer is perhaps best known for the odd nature of his death. In mid-March 1793, he was sitting on the porch of his home enjoying an afternoon nap. He wore a red cap, and as he slept his head began to bob, angering a nearby turkey gobbler who took the movement as a challenge. The turkey’s attack left Spencer with numerous cuts and scratches, from which he developed an infection that killed him on March 20, 1793.